Ledecky celebrates after winning the 400-meter freestyle race. 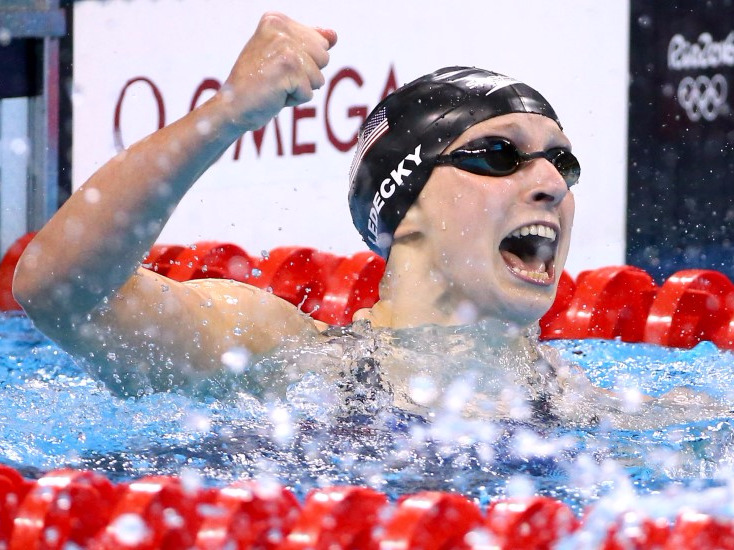 Katie Ledecky has done it again. The 19-year-old swimmer just set a new record in the women's 800-meter freestyle race at the Rio Olympics. She already won a gold medal and set an amazing new record in the 400-meter freestyle, took another gold home from the 200-meter freestyle race, and earned yet another gold in the 4 x 200-meter freestyle relay. She also won a silver medal in the 4 x 100-meter relay. And the Olympics doesn't even have a women's race in what's frequently considered her best event, the 1,500-meter freestyle. It's hard to describe just how good Ledecky is without it sounding hyperbolic. The thing is, it's hard to dispute them, and she's only gotten better since then. "She's among the greatest endurance athletes ever, full stop," he tells Business Insider. At the swimming world championships last year, she became the first swimmer to win the 200-, 400-, 800-, and 1,500-meter freestyle races in a single competition. Ledecky's world records in the 400-, 800-, and 1,500-meter distances are incredibly impressive on their own. But what's particularly crazy is that she's set these records in a way that's "actually a little bit handicapped," according to Joyner. Ledecky poses after setting a new world record in the women's 400-meter freestyle race at the Rio 2016 Olympic Games. In the 1980s, American swimmer Janet Evans set records in the 400-, 800-, and 1,500-meter distances. Those records stood until the mid-2000s, when those — and many other— records were demolished by swimmers wearing expensive, high-tech, slippery swimsuits that many think helped swimmers propel themselves through the water faster than they'd normally be able to move. In a way, this is part of the natural evolution of sports, says Joyner. Track runners now speed down surfaces that are built to be much "faster" than older courses could have been, and they're wearing higher-tech shoes and clothes while they make their moves. That's a large part of why athletes keep getting "faster" over time. But in 2010, those high-tech swimsuits were banned. And in her case, many think that she's still early in her career. Many endurance athletes don't peak until their late 20s or even early 30s. It's tough to break world records in the Olympics, Joyner says. The courses aren't necessarily built to be fastest, people have to swim qualifying heats that can tire them, and they're working through multiple events. But that hasn't stopped Ledecky. "She's absolutely spectacular. I've never seen anything like it," Joyner says.